We believe that our clients have more confidence about their financial future because we have a client centered approach focused on what’s most important to them, while building a lifelong relationship with their family. We truly care about our clients and enjoy partnering with them to achieve their financial goals and dreams. We make the planning process fun but we are also very serious about providing the best possible service and client experience. Melissa joined Northwestern Mutual in 2003. She is licensed in life, disability and health insurance, as well as the FINRA series 6 and 63. Melissa runs the investment operation component of our practice and assists in day to day operations of our investment accounts. Melissa resides in White Bear Lake, MN and is married to Matt with 5 children. In her spare time, she enjoys spending time with family, camping, hockey and crafting. Karen joined our team in 2006. She handles the insurance operations and is licensed in life, disability and health. Her responsibilities include helping you navigate the underwriting process, account servicing, and any other questions related to your insurance accounts. Karen resides in Maple Grove, MN with her husband Steve. Together they have 3 adult sons and 5 grandchildren. She enjoys spending time with family (especially the grandkids), reading, gardening, and volunteering. Northwestern Mutual is the marketing name for The Northwestern Mutual Life Insurance Company, Milwaukee, WI (NM) (life and disability insurance, annuities, and life insurance with long-term care benefits) and its subsidiaries. 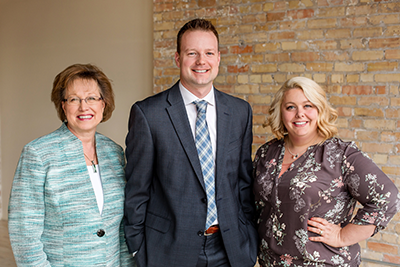 Jason Steven Rognrud is a Representative of Northwestern Mutual Wealth Management Company®, (NMWMC) Milwaukee, WI (fiduciary and fee-based financial planning services), a subsidiary of NM and federal savings bank. All NMWMC products and services are offered only by properly credentialed Representatives who operate from agency offices of NMWMC. Representative is an Insurance Agent of NM, and Northwestern Long Term Care Insurance Company, Milwaukee, WI, (long-term care insurance), a subsidiary of NM, and a Registered Representative of Northwestern Mutual Investment Services, LLC (NMIS) (securities), a subsidiary of NM, broker-dealer, registered investment adviser and member FINRA (www.finra.org) and SIPC (www.sipc.org). Jason Steven Rognrud is primarily licensed in Minnesota and may be licensed in other states.